SAN FRANCISCO — Although it would be hard to tell from the volume of his work, David Hockney, now 76, has had a rough year. Last October, this celebrated British artist had a stroke, which left him unable to complete his sentences for a time. In March, one of his studio assistants in East Yorkshire, part of a tight-knit circle of aides, collaborators and former lovers, died in Mr. Hockney’s home after drinking drain cleaner on the heels of a drug binge. And slowly but surely, Mr. Hockney’s hereditary deafness has progressed to the point that he depends heavily on two hearing aids and still needs to lean in for conversations. So it’s not entirely surprising that Mr. Hockney, one of the greatest colorists since Matisse, found himself working exclusively in black and white. He stopped using his iPad as a visual diary for colorful sketches that he would circulate to the delight of friends. Even his depiction of the arrival of spring in the East Yorkshire countryside looked rather bleak, with spiky trees and their thin gray shadows rendered in charcoal instead of the lush green-and-purple palette he used for the same landscape, same season, just two years earlier. But part of Mr. Hockney’s charm as a painter — and person — is a certain resilience or even insouciance, an unwillingness to abandon pleasure and beauty in the face of troubles. And his return to California this summer, after primarily living and working in England for the last eight years, has been accompanied by a return to color: not just any colors, but some of the famous cerulean and cobalt blues from his classic swimming pool paintings of the 1960s. With his cane at one side and his red iPad case once again at his feet, Mr. Hockney sat in a gallery at the de Young Museum here one day recently watching the installation of his massive new survey, “David Hockney: A Bigger Exhibition.” Running through Jan. 20, the show features over 300 artworks made since 2002, including some Yorkshire landscapes from his 2012 blockbuster at the Royal Academy of Arts along with other landscapes and several series of portraits. Over the decades, Mr. Hockney has worked in depth on various series, shifting from one medium to another — from paintings to Polaroids, theatrical stage sets to intimate line drawings, watercolors to digital images on iPads — as he shuttled between the United States and England. A few of the new works, like a portrait of a Los Angeles friend, Richard Sassin, seem rather cheerful. 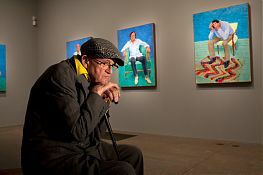 “He told me it was the greatest day of his life, being painted by me,” Mr. Hockney said, sounding amused. But most appear more somber in expression. And the first color portrait he made upon his return to California in July is a powerful expression of grief. It shows his lead studio assistant, Jean-Pierre Gonçalves de Lima, slumped in a chair with his head resting in his hands, elbows on his legs. The strident colors of the zigzag-pattern rug inject some high-voltage energy into the picture, not unlike the way van Gogh used vivid color contrasts to sharpen a look of sadness into anguish. “I thought the rug was a little like his mind,” Mr. Hockney offered. The sitter’s pose was more directly inspired by van Gogh, modeled on his 1890 portrait “At Eternity’s Gate” and an earlier lithograph of a war veteran. Mr. Hockney said he positioned his sitter that way because he was thinking about Dominic Elliott, his 23-year-old studio assistant, who died in March. The “we” hangs in the air. So the painting was also a sort of self-portrait? Pausing for a moment, he admitted, “I think it was a self-portrait.” Then, perhaps eager to move on, he turned to another wall with a later painting of Mr. Gonçalves de Lima, who now faces the viewer with a cigarette in hand. Yes, Mr. Hockney, known for his feisty anti-anti-smoking tirades, admitted that he still smokes and was tempted to do so outside the museum: “I think it would be great to say I was fined $100 for smoking in Golden Gate Park,” he said. Van Gogh’s “At Eternity’s Gate” happens to be visible in the exhibition as well. Along with hundreds of other artworks dating from 1350 to 1900, it has been photocopied and secured to what is known as the “Great Wall”— a 72-foot-long set of panels that Mr. Hockney built in his studio as a visual aid while doing the research for his 2001 book “Secret Knowledge.” The book made the sweeping case that a wide range of painters from van Eyck to Caravaggio used devices like curved mirrors and the camera obscura, which changed the course of painting in the West. Mr. Bailey said he finds the “Great Wall,” which has never been exhibited before, fascinating in light of Mr. Hockney’s connections to the old masters and their range of techniques. Mr. Hockney, of course, has another reason for displaying the “Great Wall”: He welcomes any opportunity to advance his theory on optics, which initially proved so controversial. Some academics dismissed it for lack of historic documentation in all but a few cases, but others were more supportive, and he continues to find the visual evidence compelling. “Just look at the shadows in European paintings that became so big around Caravaggio’s time,” the turn of the 17th century, he said heatedly. “There were no shadows in Chinese, Japanese, Persian or Indian art. I’m sure that comes from optics,” he added, noting that lenses require a strong source of light. The de Young show may add to the debate with an unusual presentation: seven flat-screen TVs hooked up to display animations that show the process of Mr. Hockney drawing, one brush stroke — or more precisely, one finger-swipe — at a time. His plan back in the studio is to expand his portrait series with a wider mix of sitters, perhaps using a new, slower-drying acrylic paint. “I started with friends and people who work for me, but I’m going to do some young people next,” he said. So there is no retirement in sight for David Hockney? And just a few minutes later, joined by an assistant, he left the galleries grinning like a kid: He was about to sneak a smoke.